FreshBooks is barely making it to our “Popular Project Management Software” list. Not because it is unpopular or not useful. But because it can barely be called a “Project Management Software”, rather being an online billing\accounting platform by nature that allows managing certain aspects of the business projects. This is an online application, with mobile applications available for it. The “Painless Billing” is what the company calls their service. Not only painless, but professional. Without hiring an accountant. Using FreshBooks you can do the time tracking for the projects, build professional estimates that can be easily converted to invoices later. All of your billing is stored in an archive and is available any time later for you to get back to it. The system can bill the clients using multiple payment methods in addition to PayPal. The clients can be charged in different currencies. You can set various permissions for your clients to access the billing information. The system also allows creating accounts for the contractors, billing all of them within one environment without sharing the client information with them. The time and task progress tracking are pretty good in FreshBooks. You can get instant updates on the project status from your staff, track time as the team works and share it with your clients to make sure they stay on budget. 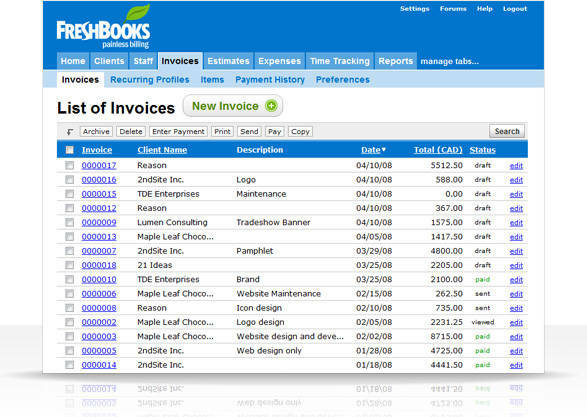 With FreshBooks you can establish professional image for the smallest business. The system builds professional invoices, project estimates and reports based on the simple information provided. You can set up the access for your clients in order for them to keep track on the projects and look professional. Anything can be branded – from your invoice to the login pages for your clients to see. FreshBooks is made as easy as possible, eliminating all the unnecessary steps, allowing you to build a professional invoice or report in just a few clicks. The pricing for the service varies from free to $39.95\month. No extended contracts, you pay month-to-month and can cancel at any time.